Philosophers tend to focus on the wrong questions. They ponder lame questions like: "Do you humans have souls?" or "Is an afterlife possible?" The real important questions, though, are: "What the hell is Grimace?" and "Why the hell is he called Grimace?" Ronald McDonald is a clown, and Hamburglar is a small-time, hungry thief. 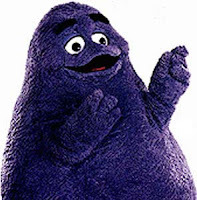 Grimace is a purple blob and baffles me. Who are you, my purple friend? The word "grimace" means a frown, or a facial expression of displeasure. Why would this jolly purple guy have such a negative name? It turns out out that Grimace originally was a villain, "The Evil Grimace." He had an extra pair of arms and stole milkshakes, then hoarded them. ... I love this world. 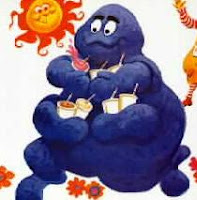 After some crime, Grimace's character was revised to lose his extra arms and be a good guy. He then was part of the McDonald's gang and saw how Hamburglar got his stripes and how once Hamburglar wished everything he touched turned to cheeseburgers.